What if we told you that your window can become your AC? You don’t even have to give up your whole window when you opt for the quiet window air conditioner. 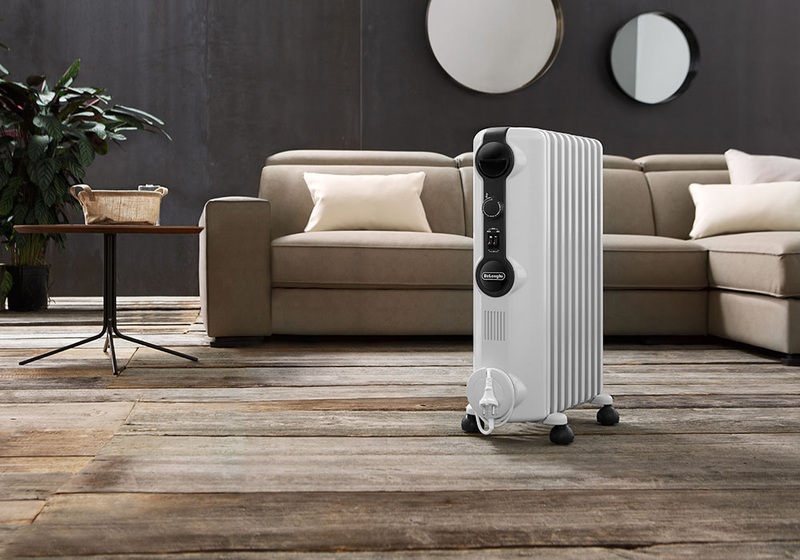 No more units lying on your floor, being in the way, no more electronics hung on a wall and most importantly, no more excessive heat and noises. All of the above are key traits of window air conditioners and the only thing left for you is to scroll down and select the unit that best suits you from the handpicked products in our reviews section. 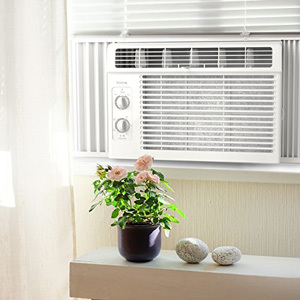 Read all about window AC and see how they stand out. There are some drawbacks which we haven’t kept a secret. Enjoy the information and make the right selection. DIMENSIONS : 19 x 21.5 x 14.5"
Starting our reviews with a proven product is always a good idea and here you get a clean unit with just enough controls and functions to make you feel nice. 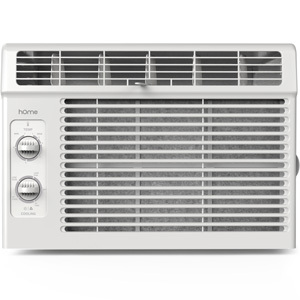 The manufacturer has completely taken care of your when it comes to installation as the hOmeLabs Window Mounted AC comes with a support bracket, side panel leaf covers, and the window seal foam. All you need to do is follow the instructions closely. You need to be sure that your window is not wider than 36 inches. You will also need an opening larger than 23 inches because that’s the width of the unit. A huge upside is that the airflow of the AC can be directed up or down. The filter can be washed with a soapy water or dish detergent. At 5000 BTU you will be able to cool a room of about 150 square feet. So here we get a relatively small unit which will really aid you when you have a tight opening. The unit is only 7.5 inches deep and will be good for areas of up to 250 square feet. The cooling power is 6000 BTU but it can easily be controlled through the digital thermostat. Your convenience is further boosted by the presence of a timer. It can be set so that the AC turns on automatically whenever you want. This will let you start cooling off a room before you are even in it. Since power outages may occur, here you have the Auto-Restart feature. It will let you keep your previous settings and that’s quite the advantage. When it comes to efficiency and energy saving, you really get the best thing. This unit qualifies for Energy Star which is an important energy-saving standard. The unit is also pretty quiet with less than 40 dB. The power output of this unit is what perhaps sets it apart from all other window ACs you will encounter. Here you will need just 57W when in fan-only mode. Even if you go with the compressor, the power output will be 324 watts. In any case, this is a great bargain because you can expect some 5000 BTU from the Frigidaire FFRA0511R1. Don’t let the absence of a digital display fool you. 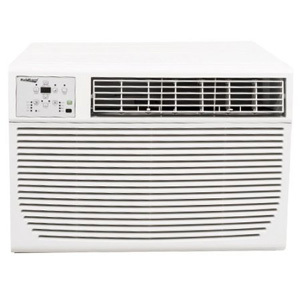 This unit is reliable and has exactly what you expect from a window AC. It has 2 fan speeds, 2-way air direction as well as 2 cool speeds. The strength of the cooling settings is on a scale from 1 to 7. Thanks to the slimmer than average body, this AC does not require a support bracket. You will need to use just a 110V circuit for this product. Unfortunately, it doesn’t come with a remote. 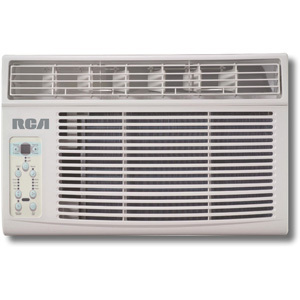 This window AC is among the most powerful ones you will see on our review list today. The LG LW1016ER will be able to reach 10 000 BTU which is quite impressive for a unit with dimensions of 23 x 15 x 22. With this product, you will be able to cool off 450 square feet and this is about twice the average window AC. Another strong side of the unit is the dehumidifier. It is quite impressive because it will be able to give you about 80 pints per day. Be ready to see a larger electricity bill, though, because the wattage of the unit is around 770W. The lowest temperature you can get is 60 degrees. There is a LED display and using the digital thermostat you can select an exact temperature. You get 3 fan speeds, a timer and there’s even Wi-Fi. As the name suggests, there’s a remote control. 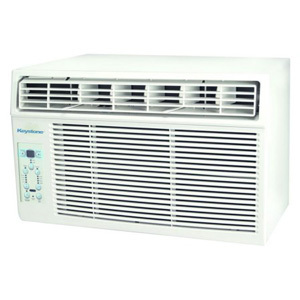 The origin is among the important factors when we talk about this Frigidaire window AC. It is made in the USA and has a 2016 Energy Star. The efficiency ratio is really nice – 12 EER. All of this is rather important because the BTUs of the AC stand at 10 000 and without efficiency, the energy consumption will be quite high. Additionally, this unit will be good for relatively big rooms of up to 450 square feet. The dehumidifier also comes with a Clean Air function. The perks do not stop here. Opt for the Sleep mode if you want to sleep in the same room with the AC. It can get pretty quiet. Allergy sufferers will also be alleviated by the ionizer. Impurities and pollen will be removed from the air. Dehumidification is about 3 pints per hour. You also have complete control over the direction of the air with the 8-way adjustable louvers. Cools a room : 450- 550 sq. ft.
DIMENSIONS : 20.9 x 19.7 x 14.8"
Cools a room : 450-550 sq.ft. DIMENSIONS : 19.8 x 21.5 x 15"
DIMENSIONS : 18.5 x 15.7 x 13.4"
Here you are looking at the most expensive unit on our list. It is also the most powerful one but that doesn’t mean that you get the best value for your money. However, in case you want to cool off a large room of more than 550 square feet then this is your unit. You will get 12 000 BTU and when you use cooling mode the energy consumption is 1100W. Here’s the kicker, though. 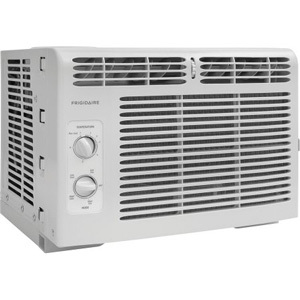 You also have a heating function with the Koldfront WAC12001W. During the winter the energy output you will require is bigger – 3500W. Even though this is a portable unit, you can seal it pretty solidly using the provided window kit. It is very convenient that you get to use the AC even during the winter. While the display does not impress with its size, the control panel is rather extensive. You get to also aim the4-way adjustable louvers wherever you wish. Customization is what really stands out when looking into the SPT WA-1222S AC. The modes that you get to select from are Dry, Energy Saver, Sleep, and Auto. When you opt for Dry, then the dehumidifier will keep any moisture from the air flow. Sleep is another essential function because you will enjoy the ultra-silent fan of the unit and will be able to rest easily around it. The most common use of such a versatile unit is in studio apartments. The lowest temperature that you can select is 62 degrees while the highest one is 86 degrees. When not in Sleep mode, though, the fan can get quite noisy with its 60 dB. What’s good is that you will never need a drain plug because there aren’t any high humidity applications related to the AC. The digital thermostat is controlled by the front panel. There is no remote control. When it comes to the raw specs and sheer power of this unit, it is truly a middle of the packed product. But the Kenmore Smart Rac AC is fully compatible with Alexa devices and this is just a huge advantage. Additionally, you can just use the Kenmore Smart AC App on your mobile device and take complete control of the AC. Energy Saver mode is great when you want to have just a tiny amount of cool air and are looking to cut down on the electricity bill. Since we mentioned power, you can select among 3 variations of the same window AC. They start at 8000 BTU and go all the way to 24 5000 BTU. Of course, the price difference is substantial. 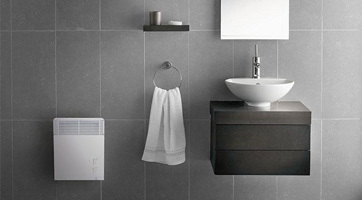 Even though, you get quite the possibilities here, keep in mind that the unit must be installed horizontally only. You better get some help installing it as it weighs in at 130 lb. This next window AC is packed with great functions and the digital display really adds to it. The control panel is located on the left side and will allow for complete customization of the work of the unit. There is also a remote control which mimics the settings that you have on the control panel. If you have a standard 115V outlet, then you are in the clear. Otherwise, you will have to buy an adapter and those are sold separately. What’s not sold separately is the window installation kit. The side panels and the sealing foam come with the unit and if you follow the instructions, you will have no problems installing this window AC yourself. It won’t be as quiet as you might wish and that’s a drawback. However, this unit is capable of taking care of an 800 square foot room. One of the perks thanks to which this unit made our shortlist are the remote control capabilities. Yes, you can access all the functions from the remote but it can also sense the temperature. This means that the thermostat of the Keystone KSTAW06C can be programmed to maintain the temperature at the location of the remote. Everything else is pretty standard and yet, very convenient because of the value that you get. 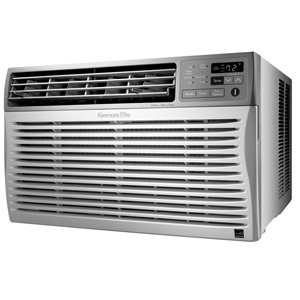 For a window AC which doesn’t cost that much, you get 6000 BTU and the incredible 12.2 EER giving the unit an Energy Star. Dehumidification isn’t off the charts as it stands at 1.5 pints per hour. Any room smaller than 300 square feet will be easily cooled off using the 3 cooling speeds. If you want only air circulation then choosing among the 3 available quiet fan speeds is the way to go. It is important to note that none of the dimensions of the unit surpass 20 inches (18 x 15 x 13 inches). Let’s not kid ourselves – you will find absolutely no serenity if your window AC unit is making bad noises next to you. In fact, this is also true about all other AC systems including the smallest air conditioners. Being able to know what any certain noise means is important and this is why we are coming to your help. Our crew has compiled a list of the variations of noises that you might encounter and we have also explained the likely reason for each one of them. Your window AC might not always sound very friendly so knowing how to deal with it is vital. Any metallic noise also known as bonging or clanking might be a sign of some issues with the compressor. This is often indicative that some part is simply out of balance. If it isn’t the compressor, then the blades of the fan might be bent or out of position. Clicking sounds typically come from electronic parts. These are plastic sounding noises. In case the thermostat is not in order, then this might be your cue to go and have it looked at. If you hear banging or loud knocks, then this is a sure sign that something is not in its rightful place. Some rubber sealing might be out of position but it might also mean that there is a problem with the compressor. Even if parts are not damaged right away, you can’t let this banging go on because it will surely lead to bad results. Reverberation is common to AC units in which some loose debris might be found. Such buzzing sounds might also indicate that the fan is failing. If you are lucky, it just might mean that the coil has to be cleaned. Another popular sound is crooning or humming. In this case, it shows a lack of power. Typically when the compressor wants to start but can’t, it will start making those humming noises. It might lead to failure of the motor, though and you want to stop using the unit immediately. Squeaking can also be encountered and in all fairness, it might be completely normal. On the other hand, you want to watch for the fan motor being alright. Many times some sort of rubbing is the cause of this. Again, it can be normal especially if the unit is brand new and used for the first time. This is the most important section of our guide today. Making the right choice is crucial here and you simply need to see the whole picture before deciding. Our crew has taken the time to make a complete comparison between the quietest window air conditioner and your typical split system ACs. Don’t expect to read anything that will state that one type of AC is a 100% better than the other. 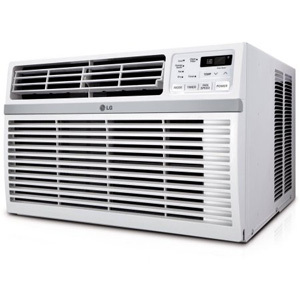 We will look into some ultra-quiet portable air conditioner pros and cons and will give an opinion based on that. Don’t worry, even though deciding between a Window AC and a split system AC is important, it isn’t rocket science. An important common trait of the two systems is that they are usually better than any central air conditioner brand. They both allow you to cool off just a separate room. With central ACs you need to have something running in the whole house and that’s rarely a good thing unless you have 15 people living there. Most users are looking for efficiency and mobility meaning that you want to cool the room in which you currently are. You do not have to comply with what central ACs offer as they truly cost a lot to operate. So the mechanism here is simple. You put a unit in the window and it cools off your room. 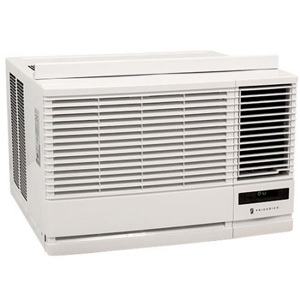 Your main aim should be at getting a library quiet window air conditioner because these things can be pretty noisy. 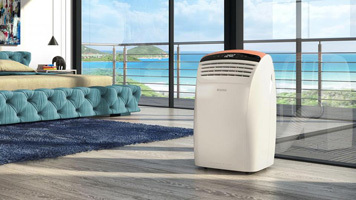 They do blow some fresh air inside and in all fairness, even the finest tower fans on the market cannot match them because all they do is circulate the air. Mounting a window AC can also happen in a number of ways. You can have it sealed in a window or maybe install it in a cutout in the wall. The second option is less popular but it shouldn’t be excluded because it can seriously mitigate the noise that you hear. On the upside, you get a very easy installation without the need to have any special skills. In fact, installing a window AC can be a pleasant weekend DIY project. More often than not, you just have to follow the instructions provided by the manufacturer closely and you will be just fine. All the supplies needed to seal your silent window AC should be provided in the set. But why are window ACs usually labeled as noisy? This is because everything is located in the same box. All the components of the device are crammed together in one body. This includes the compressor, the cooling coil, and many others. What you typically have in the outdoor unit in a split system, you have here in one joint box. Another thing that you will read in many quiet window AC reviews is related to the window being blocked. It will definitely block some part of the window if it is a sliding one. In case your windows open to the left and right, then you will likely have to seal the whole window. First, the actual window will have to be removed with only the frame remaining there. Then, you have to install the AC unit and then block the remainder of the window with a piece of wood or plastic. Horizontally you will have no issues as this is where the side panels of the AC kit come in handy. This will, of course, mean that you will have your view blocked. Very little light will come in and the access of fresh air will be limited. But let’s not forget that price matters. The initial investment here is a pretty small one. 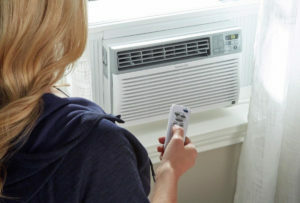 Even the most expensive window AC units are usually twice as cheap as some common split system air conditioners. So you get absolutely the same effect, identical efficiency and easy installation at a very low price. This is definitely an advantage of the window ACs. Easy to install – no professional help needed. Spend some quality time doing a DIY project. It feels rewarding. Not a huge initial investment – the price of a window air conditioner is usually more two times smaller than the price of a split system AC. Space-saving – there’s nothing on your wall, there’s nothing on your floor. You use your room entirely how you see fit. Can be noisy – since all the parts are in the same body, you will hear the compressor. Fortunately, you can opt for an ultra-quiet window unit and have this problem solved. Blocks the window – that’s the only true drawback of these units. You will have less access to direct light and fresh air. 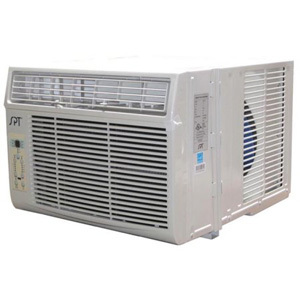 Split system ACs consist of two bodies – an external unit and an indoor one. Their composition is rather complex and this is why you have a number of things to think of prior to buying such an appliance. In this case, the compressor is out there in the external body meaning that you will barely hear any noise coming from your AC inside the room. But don’t let this fool you because the noise outside can be quite loud. Your neighbors might not be happy about the noise from your outdoor unit at all. Additionally, companies will offer you to install some rubber vibration absorbers. These dampers will significantly reduce the noise levels of your external unit but they cost extra. It’s up to you. Having an external unit is not all that bad because it is a pretty powerful one. Actually, it is so powerful that you can hook a number of indoor units to just one outdoor body. This type of convenience can be crucial to some people. It will also mean that less energy is needed for multiple ACs to work at the same time. Anyway, if you require a few split systems at home, then you might be better off installing a complete central air conditioning system instead of getting a bunch of separate units. The fact that about 95% of split system ACs also have a heating mode is a big upside. 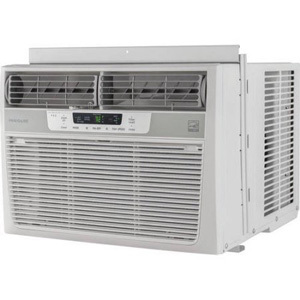 It needs to be said that this type of air conditioners are definitely among the heating and cooling systems you will be able to find out there. It also needs to be said that you get zero portability with them as dismounting is not an option. Installation is the tricky part here, though. It cannot be done by just anyone. You will need to get licensed technicians to do it for you as there are a number of procedures to be taken care of. Many time, your supplier or local dealer will have a crew ready to help but it still costs extra and it is not cheap. Window units you can install yourself for free. With split ACs we have some hole-drilling, wiring, tuning and bracket installation. One of the main arguments that people make for split ACs is actually efficiency. This is an arguable statement because the initial investment and hassle might just trump the lower electricity bill which you will pay. Let’s not forget that installation typically costs as much as half a window AC unit. Slicker design – there’s no doubt that these look better when installed properly. The external body is not very good looking but people rarely notice it. Efficient – it is true that you are likely to notice a seldom decrease of your electricity bill. Nothing outrageous, though. Permanently installed – while they can be dismounted eventually, this also needs to be done by a technician. Not to mention that it will leave behind a nasty trace on the wall along with a hole. Either way, you can’t just move the unit to any room you wish whenever you wish. Huge initial price – you can go broke when you buy one of these. You will also have expenses related to installation, vibration absorbers etc. Your wall needs to be drilled – yep, they will try and seal it but problems may still arise. Not only that it looks ugly, but condensation is also to be expected. This is where we cross the finish line of our guide to getting the quietest window ACs on the market. We see that one quality derives from the other and that we can’t have a good air conditioner when noises are involved. This is why we sincerely hope to have steered you in the right direction when it comes to selecting a domestic AC unit. Re-read some of the information if you want to confirm some things and let us know if it was comprehensive enough. Leave us a comment and share the article with others looking for a cooling solution of their homes. Thanks for reading and as always – stay put!